"Baptism is both God’s gift and our human response to that gift. It is a sign and seal of our common discipleship. Through baptism, Christians are brought into union with Christ, with each other and with the church of every time and place." 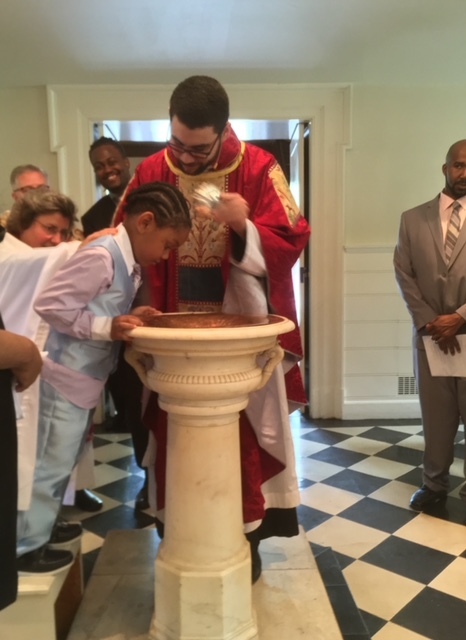 St. Luke’s welcomes people of all ages into the Christian church through the sacrament of baptism. Adult Baptisms, Confirmations, Reception, and Reaffirmation of Vows are celebrated yearly at the Easter Vigil. Our Formation Program prepares adults for these sacramental rites. The Sacrament of Marriage is a covenant between two people, entered into before God in the Church. It is never seen as a private event, and for that reason weddings take place in the presence of Christian witnesses and guests. It is a lifelong commitment by two people to love, honor, and cherish one another through life in faithfulness and true godliness. At least one person must be baptized. Persons desiring to marry or have their civil marriage blessed must contact a member of the Clergy to begin preparation and to ascertain an available date. Generally, marriage preparation and counseling must begin at least six months before the ceremony. Often there are four or five sessions. If either person has been married previously, proof of certificate of divorce will be required. Weddings at St. Luke’s are for current members and their immediate families. In the Episcopal tradition, marriage is a sacrament and one of the moments, like Baptism or Eucharist, that bind the couple and the community together by the grace of God. Our hope and expectation is that couples marrying at St. Luke’s are and will continue to be involved in the life of the Church. Being known to the Clergy and regular in Church attendance for at least six months is normative at St. Luke’s before making inquiries about scheduling and planning a wedding. A funeral is used to mark the end of a person’s life. Family and friends come together to express grief, to give thanks for the life lived, and to commend the person into God’s keeping. St. Luke’s supports our community in these important and often difficult times. Please contact the Church as soon as possible to make arrangements for your loved one. You may also contact the Church at any time to make arrangements in advance for yourself or for those whom you love. During a funeral service, a casket or urn is present, and the funeral home will contact the Church to make arrangements for the service. A loved one's remains are not necessary for a memorial service, though sometimes an urn is present. The service may be scheduled shortly after death or at the convenience of the family. The Holy Eucharist is normally part of the funeral service. Prior to making any arrangements, please contact the Parish Office at 212-924-0562 or to arrange to speak with a priest. This will assure that the church and a member of the clergy will be available to meet your needs. The Director of Music will arrange for an organist if you desire it, unless other music is requested. When planning the service, appropriate musical selections will be discussed. Hymns, sacred songs and other musical selections are “live” (not recorded) and not amplified for worship services. Questions? Please submit a Request for More Information, and a member of our Clergy will reach out to you.